For Palm Sunday the Revised Common Lectionary offers three different Gospel texts for the varying needs of churches. First there is the “Palm Sunday” option (Luke 19:28-40) which sticks to the opening scene of Holy Week: Jesus’ “Triumphal Entry” into Jerusalem. That focus is great, I think, since it nudges you to take every event of Holy Week on its own, prayerfully moving through the great events of our salvation. Second there is the “Passion Sunday” option (Luke 22:14-23:56). That includes the Last Supper, Gethsemane, Jesus’ betrayal, arrest, trial, and crucifixion, death, and burial. It’s a vast amount of text, more suitable for a readers’ theater presentation where simply hearing the story takes the place of a sermon. Third there is what we might call “Passion Sunday Lite” (Luke 23:1-49). It’s still a long reading, but it sort of cuts to the chase, starting with the trial before Pilate and ending with Jesus’ death. The “Passion Sunday” options seem to be extremely popular. The argument seems to be that people won’t come to a Maundy Thursday or Good Friday service. Or the church doesn’t even have those services. Either way, if we don’t do the cross on Palm Sunday people won’t ever even notice it. They will jump straight from the Triumphal Entry to Jesus’ glorious resurrection. The down side of using the “Passion Sunday” texts, however, is that people entirely miss Palm Sunday. And missing Palm Sunday, it seems to me, people never really get a sense of Holy Week as a week. It has a shape, and the Cross is not, actually, the whole enchilada. There are specific events that build toward the Cross, and those events matter, shaping the meaning of the week –and of the Cross. As always, I’m fighting an uphill battle on this. I may get around to posts on the Passion Sunday options. But for today, I’m focusing on Palm Sunday. I won’t be preaching this Sunday, but in my own Holy Week I need to start with a good close prayerful look at Palm Sunday. Jesus clearly knew exactly how he wanted to enter the city: On a colt. He rides a donkey into town in all four Gospel versions of the story — actually on two donkeys in Matthew. Zechariah’s mention here of both “a donkey” and “the foal of a donkey” seems to account for Matthew’s version having the disciples looking for “a donkey tied, and a colt with her.” For all his concern to show the fulfillment of Old Testament prophecy, he wasn’t quite up to speed on the parallelism of Hebrew poetry. But I digress. Luke makes no mention of the prophecy. and to know what words would convince them to let the animal go to be part of Jesus’ prophecy-fulfilling tableau. If he knew exactly how he planned to enter Jerusalem and exactly when he would do it, he probably communicated with some folks in the suburbs who owned the necessary animal. By the way, Benjamin, Next Sunday afternoon I’m going to need a donkey. Can I borrow yours? Sure, Jesus, I’ll tie it right here. They won’t even need to come into the village. Cool. It’ll be our code word, just like in a spy movie. Um… What’s a spy movie? Maybe what gave me a little moment of revelation was obvious to you already. I don’t know why I thought it was a miracle thing — except that there are so many mysteries and miracles in the Gospels that it is easy to see them even when they are not the point. Actually, Year C, when Luke’s Gospel is the focus, might be the year to use the Liturgy of the Passion texts instead of the text for the Liturgy of the Palms. Why? Because in Luke there are no palms. Not one. Not a single frond. It’s all cloaks. They put some of their cloaks on the donkey and made a carpet of cloaks on the road for the donkey to walk on. They shouted out. It was royal and it was festive. There just weren’t any palms. 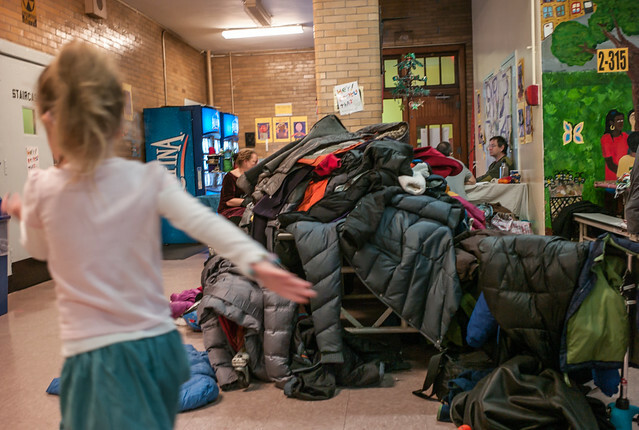 This Sunday instead of waving palms, the kids in the procession should throw down big piles of coats. The most evocative thing in Luke’s text, though, the thing that becomes the focus in the end, is Jesus’ interaction with some grumpy Pharisees. They were indignant at what Jesus’ crowd of disciples were doing. Were they upset that Jesus set up the scene so that he was fulfilling Zechariah’s prophecy? No they complained about the disciples. Were they upset about the cloaks being laid down like a carpet? Well that was probably a bit scary to them. The military leaders took off their cloaks and laid them down as a royal carpet for Jehu — at the beginning of his journey to overthrow the current regime. Were they upset about what the people were shouting while, idiosyncratically, not waving any palms whatsoever? If the Pharisees were concerned about the Romans squashing any rebellion in the Jewish community, you can see how all of this would worry them. Jesus set it up to show he was the messianic king of Zechariah’s prophecy. I think the Pharisees were worried that the crowd of people, now a “multitude of the disciples”, were thinking of him as an earthly king. It was the same fear Pilate had, and which Jesus specifically denied in John 18:36 — but not in Luke (cf. 23:3). In Luke this claim of kingship, and this threat of insurrection, is the substance of the accusation brought against Jesus at trial (cf. Luke 23:2 & 5). The idea that Jesus is king is still pretty dicy for us. We like to sing about it, like the crowds on the road to Jerusalem. But we have a hard time with the implementation. If “Jesus is king” means he’ll come and deal with our enemies and our problems, well and good. But if “Jesus is king” means we have to live by the laws and priorities of his kingdom, that’s a tougher go. And if “Jesus is king” means we have more allegiance to him than to the totems of our culture — our football team (hey, I live in Pittsburgh…), our flag, or the rights named for us in our constitution — well then that gets to be pretty complicated. Jesus was very willing to accept the people’s praise for him as king that day. He knew that people would soon be far from praise, and take him to his death. But that day was about the truth of praise. When they said Jesus should stop the disciples from praising him, Jesus said that was impossible. If they stopped the lifeless stones on the ground would sing out in praise. All creation was waiting for Jesus the king. All creation needs him as king still. Anyway, before I go on too long, let me just wish you a very happy Cloak Sunday. I’d love to send you all my Monday Meditations (as well as my other articles and announcements). Scroll down to the black box with the orange button to subscribe and they’ll arrive in your inbox most Fridays. Blessings on you as we approach Holy Week. Yes, finding a good element to take as a metaphor is a great way to get traction for your sermon. I like the one you chose. As for the code word vs. miracle question, very little rests on it of course. But miracles in the Gospels tend to be for the sake of helping people, whether healing, feeding, or resurrecting. When Matthew, for instance, says the whole traveling-by-donkey(s) scene happened instead in order to fulfill a prophecy, it seems rather unlike the regular miracles. And since it was arranged for by Jesus who sent them to town with a specific message and known response, it just sounds like he had it all worked out in advance. Blessings on you and your congregation too this Holy Week! I love your “Cloak Sunday” idea and the photo! Thanks for a great idea that keeps the focus on how the multitude – and we -praise Jesus.